Summer is over, blogging can start again! In the beginning of the Summer we spent a couple of weeks in Stockholm and Copenhagen, both example cities when it comes to quality of life, public space and well-being. Copenhagen struck me the most, thanks to its fantastic cycle lanes, infrastructure and places to innovate, dine, drink and hang out. We were lucky to get some insider tips from my good friend Kristoffer, that helped a lot! Still, I often hear from people that "Copenhagen is great, it's the cycling walhalla". Suddenly, even car freaks start to enjoy cycling. The natural reflex, even from tourists, is to leave their car at home and to cycle multiple kilometers in the city, even when it rains! For them, it's almost a tourist attraction to see all those Danes cycle day in day out. That brings me to the most critical point: policy makers in Copenhagen have designed their city on the human scale. It's not 'Disneyland', it's not made like this because cycling is 'fun'. No, the city serves its citizens, with fantastic parks, places to swim, streets where kids can play and cycle lanes that almost hug you as a result. Once home, tourists get back in their cars and tell each other that they had a great cycling holiday. Point final. The car life continues. And you cannot blame them. Since our policy makers have made it so difficult to cycle that you are still considered to be a lunatic when you tell them you "came by bike". Company cars, terrible infrastructure, non-visionary politicians, .... It's a dangerous, conservative cocktail that needs to be served in the gutter for once and for all. Each last Friday night of the month cyclists worldwide take the streets for a bike tour in their city. The main goal? To raise awareness about the vulnerability of cyclists in the busy streets of cities that were transformed into car paradises tens of years ago. A full explanation on what the Critical Mass is about can be found in this nice Facebook Live video that Marco Ricorda aka Marcorecorder and I shot just before taking of on Friday 26 May. After a stop at Place Meiser, where a cyclist was almost killed, the temperature was increasing rapidly. Not only because of the nice weather but also because the police got involved, gently asking us to move on. On the Montgomery roundabout (a nightmare for cyclists and pedestrians) two citizens, driving respectively a Porsche Cayenne and a Porsche Boxer, felt that they had lost enough of their precious time because of cyclists getting in their way. They started to shout and insult and even threatened a guy that next time he would 'kill him'. The police got nervous, some photos were taken, a police officer completely lost it and started pushing and punching a young man who was holding a camera. The police officer in question, probably still massively stressed after Trump's visit, arrested the young man 'administratively' and yelled at other cyclists (we were more than 200) to "allez, vas-y rouler un peu". From her tone of voice you could feel that the police officer did not have a big affiliation with two wheels. Perhaps except during weekends. After some diplomatic interventions, the Porsche guys left (with roaring engines) and cycling citizens (with bells) went for a drink. The saying 'You are not stuck in traffic, you are traffic' is (again) super relevant in this case. People often get mad, nervous or start honking when you are cycling in front of them, even when you are alone. Not all of them of course, but many car drivers went completely crazy because they had to wait for a couple of cyclists while each and every day they are stuck in traffic, usually alone, together with thousands of other cars. Where's the logic? This kind of incident is absolutely not worth repeating since it's not a battle between cars and bikes, but human beings. I could easily opt to drive around in a car, because I'll be able to listen to music and have air-conditioned seats but many people opt for the bike because it is fast, reliable, healthy and good for the city. People underestimate the power of sustainable transport as a driver for growth, better air quality and less social costs for example. You cannot blame car drivers. They are being pushed in this comfortable position, with magnificent company car and even prepaid cards to purchase fuel by our own politicians who are supposed to serve the greater good. We can also add to that years of disinvestment in public transport and decent cycle lanes. Conclusion? Our governments have turned us into car addicts. Last but not least: let's not create a 'community' of cyclists, because it will make 'us' look more like activists. Instead, talk about 'Brusselers using the bicycle'. We need to get rid of the bike as a symbol for hippies and green boys, because in the end anyone will enjoy the benefits of a cycling city. See you at the next critical mass? You probably know the feeling: friends from abroad ask you to explain how the political system of Belgium and Brussels in particular work. "Well, in Brussels you have 19 different municipalities that own certain competences or share them with the 'central' Brussels regional government." Your friends look at you with raised eyebrows and then either start laughing or ask you how things can actually move forward here. And it's true; cities like Paris, London and even New York have one single Mayor, and a holistic approach to the way the city is planned and governed. Brussels is different, it's a bureaucratic monster, things get done here but it takes an awful lot of time, 'thanks' to our political structure. Nowadays, the critical mass against these 19 municipalities 'fighting' with the central Brussels government is growing and there's a simple reason for that: citizens want to move forward. Citizens feel the potential of this great place, some politicians prefer status quo to protect themselves, and not their citizens. After this long introduction I would like to come to the point: the political structures of Brussels pave the way for exclusion. Even better: participation encourages exclusion. The following example below illustrates why. The alderwoman of cleanliness (or garbage?) of the municipality that I am living in, Ms. Karine Lalieux, organises every 3 months a 'rendez-vous' with people that are living in my neighbourhood to talk about cleanliness. Great initiative! But... as I am living on a regional street, the Alderwoman could not care less about my opinion. I am receiving this letter 'just for my information', since my street is not part of Madame Lalieux' action domain. How schizophrenic can your politicians be? In the heads of politicians these boundaries may be clear (because they want to stay in their luxury position), but citizens don't care whether a massive pile of garbage is being dumped on the corner of a regional or municipal street. Below you can find a Twitter conversation that happened last year, read and feel the kafka! Another striking example, without getting too 'dividing', but I want you to reflect on it: in Brussels we usually vote for politicians from our own language 'community'. This means that Dutch-speaking citizens vote for Dutch-speaking politicians and vice versa. In the end, this drives exclusion as well. Why? Because a politician like Fadila Laanan, who is the Regional Secretary of State for cleanliness, couldn't care less about my opinion because the chance that I will vote for her in the future, because I am Dutch-speaking, is nearly 0%. In reality I could of course vote for her, but that's the way Brussels' politicians reason nowadays. Just reflect on it: you are always in one or another way excluded. We want our politicians to work at the service of the city, in the interest of the city and its citizens. So, let's stop accepting this madness. It will be more efficient, holistic, clearer and way cheaper! Look at you, standing bravely on a piece of no man's land between diesel fumes. Well done, you made it to the papers with a nice quote announcing that you would block the construction of cycle lanes on the dangerous Avenue Franklin Roosevelt, even if you had to block it physically. I will be honest with you, cher Alain, I've had it with politicians of your generation. You are from the same angst generation as the ‘Brexiteers’ and Trump voters among us: conservative, anti-change and changing your opinion whenever it serves your personal interests. You are using fear as an argument to counter progress. You are a sports fan, given your previous role at the Belgian Football Association, but you don't want people to use the bike, exercise and stay healthy? 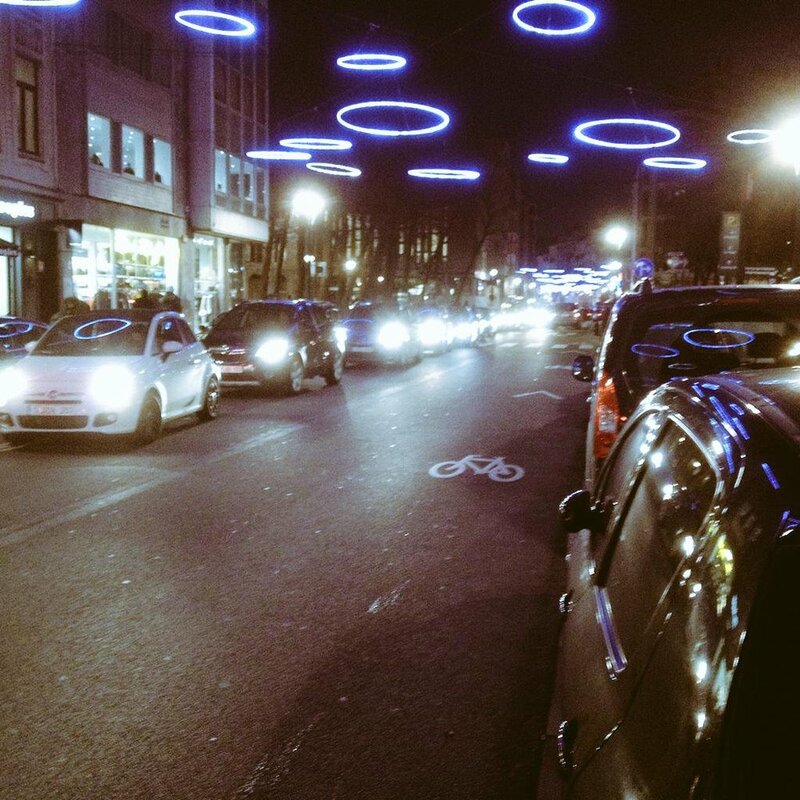 You want, and I quote, 'traffic fluidity' in Brussels? You are the Alderman for sports, but you don't want people to move around actively? What is your agenda, Alain? I see, you are the Alderman of 'Seniors' too, perhaps they are more receptive to your messages like 'invasion of the bicycle' and 'bullying cars'? We all noticed on your infamous Facebook page that your Senior fans were cheering for you, and your tough language: 'Send that Flamand back to where he belongs! ', 'Is he still sick? ', 'Well done Alain!'. You are scoring goals for your voters, Alain, well done. Cher Alain, let's try to use a different argument. What is your view on the impact of car use in our, your city? What about the lungs of your, our children and grandchildren? Do they deserve brown fluids in their lungs or traffic fluidity? Many cities around us, not far away even, are approaching public space, mobility and city life in a completely different way nowadays. Academics, visionary Mayors, researchers, citizens all over the world are striving for a better city. Why? Because we love living in cities, not driving. Thanks to politicians like you Brussels will never be able to lead by example on these matters, but will have to follow with years of backlog. 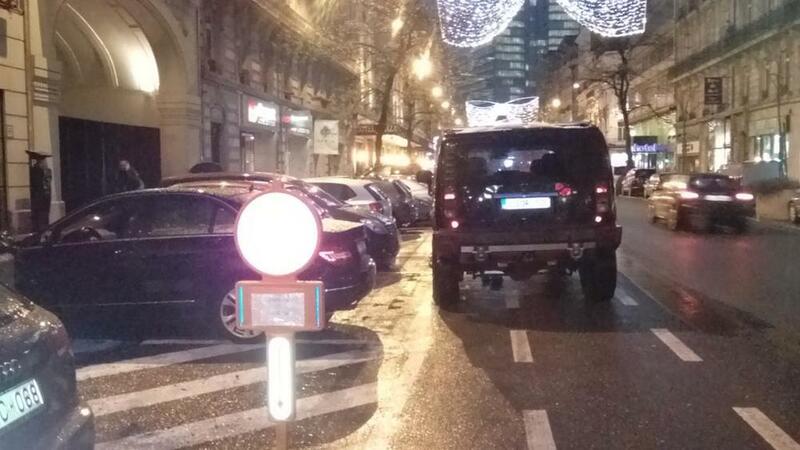 Cher Alain, how is still possible that you and your 18 other colleagues in other Brussels' municipalities can block or destroy holistic plans, based on arguments such as "that street should be 30cm wider, so we cannot construct cycle lanes"? Your generation of inward-looking politicians will make our generation, which is not afraid of change, lag behind for years to come. The consequences of your short-term 'status quo' policy will have a disastrous impact on us, citizens, and your, yes Alain, your city. Brussels is a fantastic place to live but apparently a great city for illegal garbage dumping as well. In many areas of Brussels people literally leave the house and can 'enjoy' a magnificent collection of garbage in front of their door. Not only 'normal' garbage like white plastic bags, no, also toilets, construction waste, food, cans, sofas, you name it! It makes me very unhappy that fellow Brusselers are not ashamed to trash their own streets, to attract rats, to make this an unhappy place to live in. And that made 'Leo Not Happy' either. Leo Not Happy is the alter ego of Adel, an engaged citizen who wants to raise awareness about the garbage problem in Brussels. 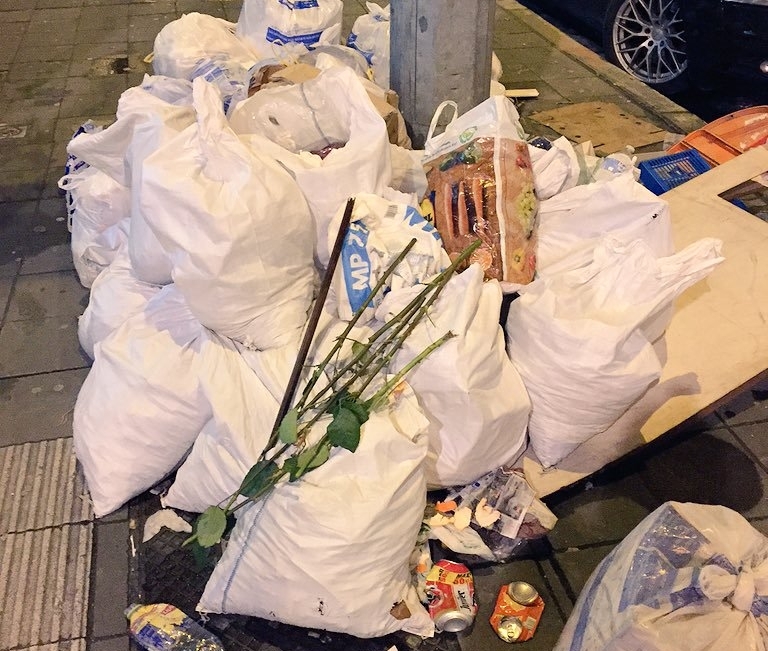 With his Facebook page, Leo Not Happy organises garbage collections with citizens from various areas in Brussels. With the help of the cleaning services of the City of Brussels (! 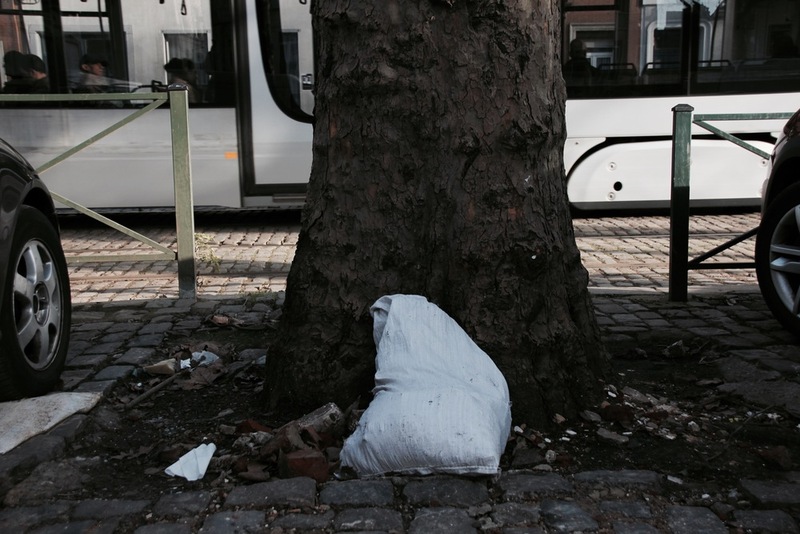 ), who provided bags, gloves, a truck and other accessories we made Brussels clean for a while. It was enormously rewarding to see citizens from all ages, languages, origins and even municipalities to fight for a cause. People that passed by even said 'thank you'. And that's what it's all about; changing the habits of citizens, making them think twice when they throw away their cigarette, almost re-educate them in a way that it will also benefit them. Combined with repressive measures such as cameras re-education should be a priority, and we thank Leo Not Happy for that! I live in the centre of Brussels, the centre of Europe, Belgium's capital. My area is 'developing'; the Region is soon building separate cycle lanes and a huge park at Porte de Ninove. At this stage we can only 'hope' that these infrastructure interventions will make this a better place. Because today my area is dirty: our garden is basically a dump, the 'petite ceinture' is a highway without speed limits (and not one single politician cares about that) and our street consists of so-called garbage hotspots. Basically, for two years now most of the corners of my street, the Boulevard de l'Abattoir, are polluted with anything you can imagine; from toilets, to rotten food, dismantled furniture, carpets, etc. I have tried to reach out via Twitter multiple times to non-visionary politicians like Fadila Laanan and Karine Lalieux but without real success I mean, if you are serious about using social media in political communication then stop the self-promotion of the great things you are doing in life. No, be accountable, provide 'your' citizens with answers, with solutions. Only Alderwomen Els Ampe and Ans Persoons are taking social media seriously to communicate with citizens here in Brussels. Lalieux (Alderwoman for cleanliness since 2006!) once replied to me by applauding her own initiatives, without focusing on the real issue; the same places are used to dump trash each and every day. During a 'district meeting' she also ignored the question, so I decided not to go anymore. She may be too busy with her second job as MP in the Federal Parliament. Can you imagine being a full time MP and having to take care of the cleanliness of a city with +100k inhabitants? That's bonkers! The question remains; where does all the trash come from? My street should be mentioned somewhere in the dark circuits as 'the place to be' to get rid of your trash because one, or even five families together, cannot produce the trash that we find in our street. The point is: if you know that these places are known to be hotspots, then why is no one acting? It makes it even more difficult to respect the area you live in when you see all the garbage around you. We are literally wasting the future of kids who, until now, only grew up with the idea of trashy streets and could never play in a park on the other side of the street because it's reserved for the nasty habits of some Bruxellois and, who knows, people from far outside! This situation sketched above probably rings a bell to many Brusselers so let's try to be constructive. 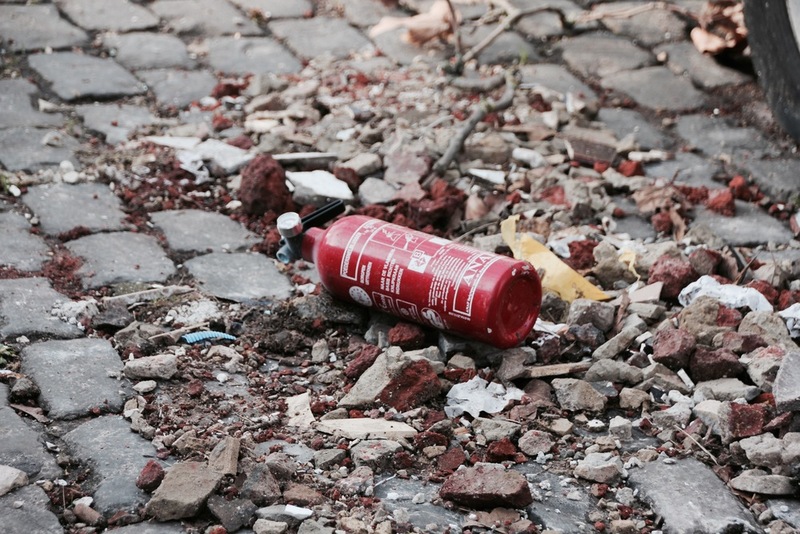 Below you will find 8 suggestions to overcome the trash troubles that Brussels is facing today. Please provide more ideas in the comments section! 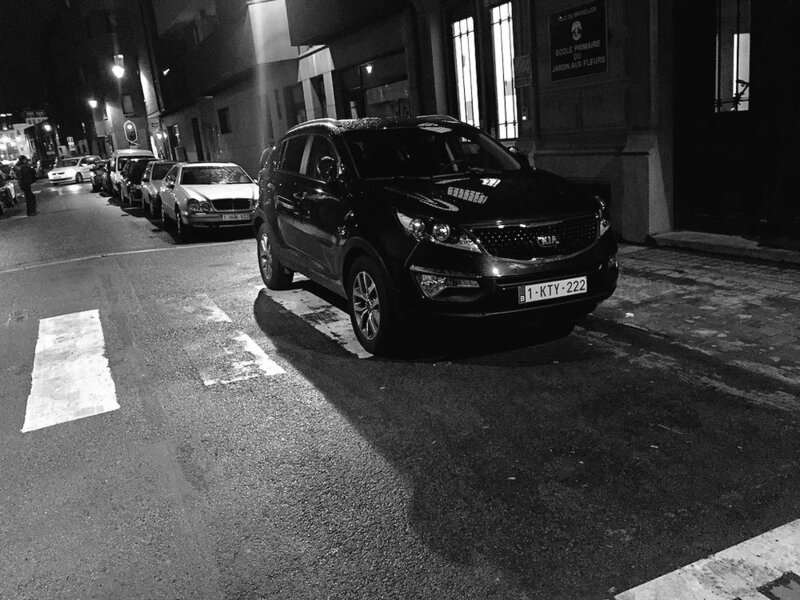 Repression: use cameras, just like in Molenbeek, to observe these places for a couple of days and fine the criminals. Use underground waste containers and let people use it for free all the time. Organise 'exchange markets' for inhabitants where the things you don't need are exchanged for things that your neighbours offer. Organise more than two 'big waste' free collection rounds per year. Do it every month and communicate about is wisely. People don't know when it's time to put the blue, white or yellow bags outside: inform people with dedicated calendars. Provide incentives for citizens: make them bring green waste from fruits and veggies to so-called district compost centres; once they have composted 20 kilos of waste they will receive a free bag of potting soil to cultivate plants and flowers on their terrace or garden. Organise guerilla actions to show that polluting your neighbourhood is a no-go, just like here in Portugal or in London . Provide more public space; the parking dump on Boulevard Poincarré/Abattoir needs to be transformed into a green haven, as soon as possible. Cars take up space, a lot of space. Very slowly cities are starting to understand that providing public space for human beings to live in will actually increase life quality and air quality. It will make you want to engage in conversations, it will make kids play with each other without constraints. Public space should be given back to the public. In Brussels, we are far from an ideal situation. But we're hopeful; Google Amsterdam, Rotterdam or Utrecht 20 years ago and you'll see the difference. Dutch cities teach us that a shift in public space will shift behaviour. Let's look ahead at Brussels. Imagine the Chaussée de Charleroi or Waterloo or practically any 'Boulevard' in Brussels. Now... Close your eyes and dream of what your city could look like. What should it consist of? Ready? Now open your eyes and scroll down. A big thanks to Johanna Medvey for her illustrations of the beautiful houses and to Dami De Jonge for showing us what the future could look like. I was quite amazed when I read this quote in an article about Brussels' congested roads in The Wall Street Journal. Traffic is a result of policy measures that block cars, Alderwoman for Mobility and Public works of Brussels Els Ampe explains. A missed opportunity for Ms. Ampe to add some nuance to the urban mobility debate, to defend her Piétonnier/car-free zone that "gave back the city to Brusselers". No, it's all the fault of an 'anti-car lobby' that is making the lives of cars and their owners miserable. But now, I wonder, who or what is that anti-car lobby? Which obscure organisation is making it so difficult for cars to drive in the city centre? Which movement constructed hundreds of kilometres of cycle lanes, buses and trams everywhere, closed parking lots ... to make the lives of Brusselers more convenient? I would be excited to know the answer to this pertinent question. Who is pro-community living and contra people in their cars, mostly alone? THE ANTI-CAR LOBBY OF COURSE. But who are they?! Anyway, I would like to thank the anti-car lobby for making this city so great; Brussels got rid off cars, full of green zones for kids to play in, fantastic air quality, public space, big car-free squares etcetera. Thank you, anonymous lobby! Also, please check the blogs called Destroy Brussels and Reasons My Car is Parked Here. I took these pictures in only 10 minutes time. Between two 'urban highways', where speeding cars galore, Porte de Hal and Porte de Ninove are connected through a long concrete strip full of parked cars and loads of garbage. It's called no man's land. Things are slightly changing since the Brussels' Government decided to build a park on the dump of Porte de Ninove in two years from now. But for many Bruxellois, it does not end there because no man's land remains untouched. The park 'stops' at the beginning of the urban dump. It would be an ambitious but necessary statement to transform this piece of rubbish into a park too. Because the population deserves it. This long strip is a border between Brussels and Anderlecht, a real frontier between the poor and the poorer. A place where nothing is beautiful, where no dreams exist. In this area only 60% of the population has access to a nearby park or green zone, the average in the entire Brussels-Region is more than 80%. Additionally, the average size of a house is *only* 60 square meters, while the average is 74. Also, the net income per inhabitant in this area is extremely low: 8.500 EUR, the average is almost double. The area is poor, and nothing makes people want to love it. The streets are filled with speeding cars, there are no nice shops, the streets are filled with rubbish and no entertainment opportunities exist. It's a dump of garbage, of aspirations, of new beginnings and endings. Which courageous politicians don't fear the 'public opinion' of 100, maximum 200, parked cars? Who is willing to stand up and give people what they deserve when they exit their tiny apartments? This is the boulevard of shame, but it can be transformed. Let's revert to the alarming accusations about the Piétonnier. I kept my eyes and ears open during recent months and weeks and I started to collect a first series of myths. This argument is put forward by many people who are against the Piétonnier, as to illustrate the uselessness of "the thing". The question put forward here is: what should we do with public space in general? Do we need to cover it, or simply transform it into a big parking lot? Naturally, it rains in our country, but should this be a reason to get rid of scarce public space? No way ! Rain sounds better when it drops on trees than when it drops on top of cars. Seriously? 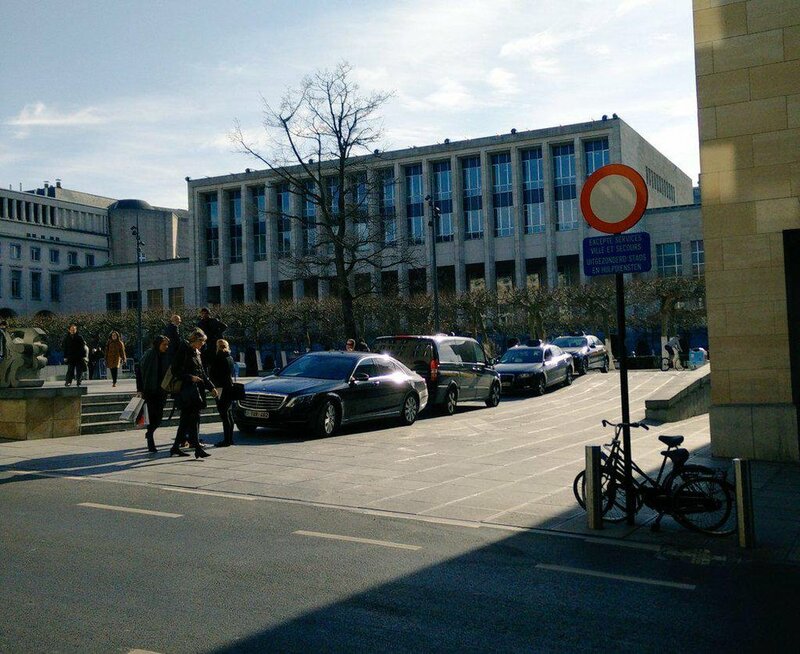 The centre of Brussels is already packed with parking lots, underground and on-street. Moreover, our politicians have even ensured that we can park for free anywhere from 18h onwards; which makes underground parking totally redundant (for now)! 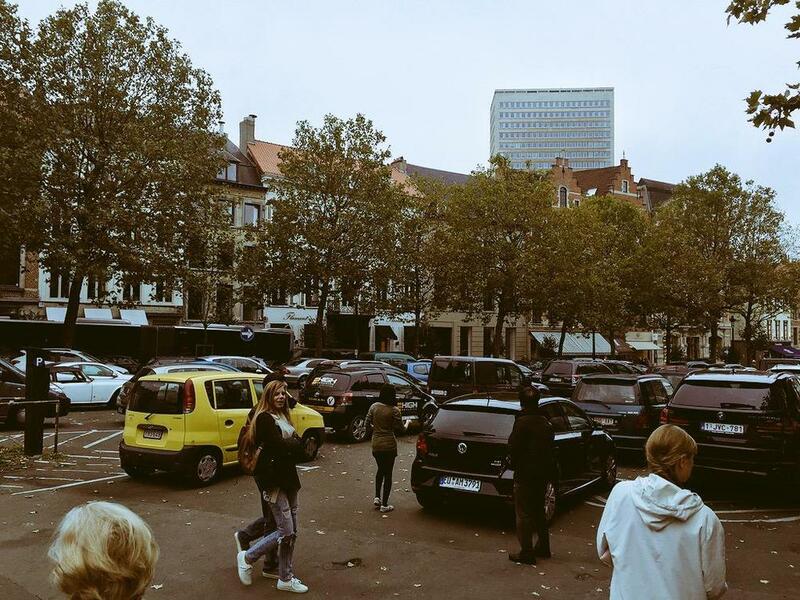 Let's try to be a serious: parking is no big deal for those who really want to use their cars: around la Monnaie there are 2 car parks, at the Brouckère there are 2 car parks, at Rogier, around Arts-Loi and Midi Station, ... It's even possible to park near the very 'source' of the Piétonnier. Several studies indicate that cyclists and pedestrians spend more money per capita than drivers. These costs are calculated on the basis of fuel consumption, parking tickets, the loss of time during traffic jams, etc. Moreover, cyclists and pedestrians are less in a hurry. So, dear merchants, think a little while: do these 30 or 40 parking spots in front of your door really make the difference ? I'm deemed to say no. Good communication, however, is vital to attract new business. A lot depends on politics too: people need to be"pushed" towards sustainable mobility. No, Brusselers (and people in general) are dirty. And they particularly love to showcase this in public space. 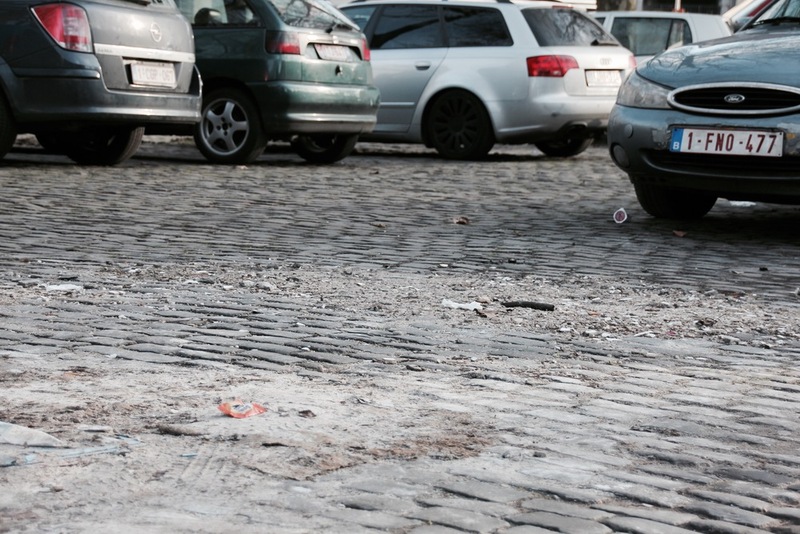 If you live in Brussels, you know that illegal dumping of garbage seems to be a national sport in the capital. Waste is dumped everywhere and at any time, also on the Piétonnier. 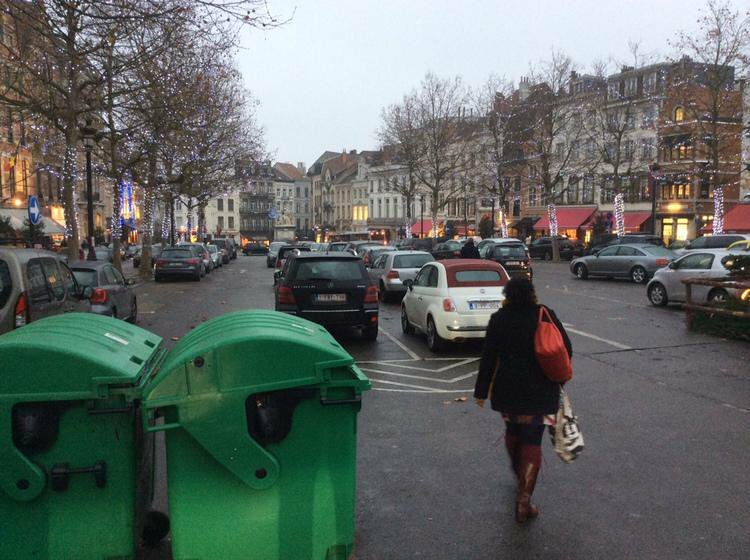 But change is coming: the city of Brussels has installed plenty of garbage bins and we even have smart bins now! For many citizens, the Piétonnier is nothing more than a closed street. Others consider it to be a start 'towards a new city', and visionary politicians think the same. It's time to create a new urban structure, where the focus lies on the human being. Numerous cities have forgotten that the most effective way to move exists since the beginning of times: walking, running, crawling, strolling. We'll have to conceive and design our cities accordingly in order to develop an entire new flow in this city. I often hear this complaint. But would you have the same reaction after you've started to construct your house after one week: "I would like a new house, but not in this dump!" That doesn't really make sense, right? No, the final result matters. Recently Strava has made available heatmaps of cycling and running behaviour in cities. The maps 'only' include data from Strava users but when we look at the map we can immediately have an overview of where people cycle and where not. In the picture below we are only looking at the centre of Brussels but it's clear that there are many missing links. The inner ring around South station is not used frequently according to data, while the inner ring near Rogier/Botanique is! Recently separated bike lanes were built in this area, which makes it more safe for cyclists to ride there. On the Boulevard du Midi and Abattoir cyclists have to share the road , surrounded by white lanes. But often cars park on the cycle lanes and speed limits are ignored massively. People use the separated cycling lanes on Rue de la Loi a lot while Belliard, which has not even proper pavements, is almost not frequented. Other examples include the Rue Blaes and rue Haute, and again a lack of infrastructure could be the reason for less cycling. 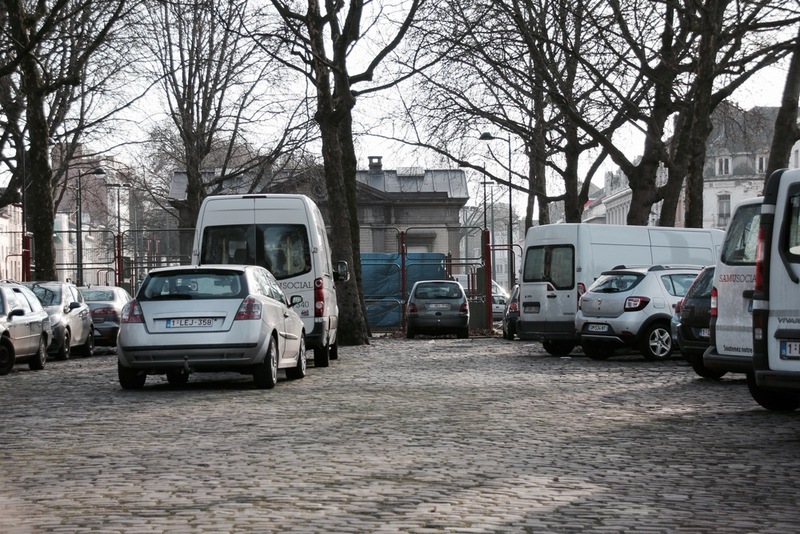 Or Rue Laeken, which could be the perfect connector between Brussels South and North. One can hope that policy makers will analyse these data to connect the missing links and to work together with each other. Since Brussels has 19 different municipalities it's not obvious that municipalities will solve the missing links by cooperating and communicating with one another. The very light green lanes should become red hot heat in the coming years. That's what we expect from politicians with a 'vision hero'. The American Chamber of Commerce in Belgium asked me to write an op-ed about urban mobility in Brussels for their newsletter/website. You can find the entire text below. 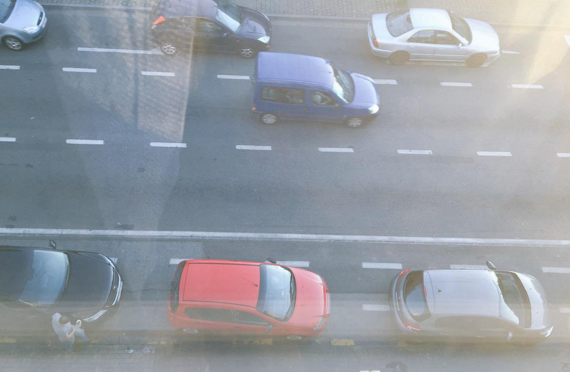 Brussels is a typical example of a car city that was built to meet drivers’ demands rather than to fulfill the criteria of a city that takes care of its citizens. Our growing cities can be a key driver for green growth. By investing in integrated solutions and cross sectoral long-term planning we can create liveable cities for people and thereby show how challenges all over the world can be turned into attractive opportunities. Join the Future. Think Denmark. We live in the most congested city of Europe, full of traffic, air pollution and aggressive drivers. A lot of us are getting literally sick of it. That's why The Pang collective launched this amazing video to encourage everyone from grandma to baby, from shopper to green bobo to start the Vélorution in Brussels. Share this video! My infographic about cycling expats in Brussels was quite popular. It was picked up by several Belgian media and also The Bulletin and New Europe reported on it. On top of that I was asked by TV station Belgique 21, which targets French expats living in Belgium, to give an interview about the current cycling situation in Brussels. You can watch the interview below. Belgians love cycling. Since Eddy Merckx we've had more cycling champions than we’ve played World Cup football games. Needless to say, cycling is a part of Belgian DNA. And although everybody loves cycling as a sport, it still hasn't become a habit to use a bike instead of a car to bridge short distances. That's one of the reasons why a lot of cities in Belgium lack decent cycling infrastructure and thus cycling culture. As an experienced cyclist in Brussels I have fallen victim to insults and aggressive behaviour quite a lot now. Moreover it’s extremely frustrating that roads, even big avenues, lack sufficient and safe cycle lanes. In most cases you have to share the road with cars on so-called cycle lanes, which are often driven or parked on. The suggestion marks (painted bicycles on the road) are even worse and have no legal force. They just warn drivers that cyclist 'might ride here too'. Brussels is rich in its diversity, and among different cultures living here there's also a well-represented (EU) expat community living and breathing the city. I know that a lot of my friends think similarly about the current, often dangerous situations on the road. But what's the opinion of expats regarding cycling in Brussels? To determine this I launched an online mini-survey which focused on bicycle safety, cycling lanes, the bike-sharing system Villo! and the possible solutions to the problem. In total 202 people responded to the survey in a period of nearly three weeks (24 January - 12 February). Promotion was principally done via Twitter. The results below are quite striking! I want to thank graphic designer Bert Sap for designing this infographic.